Standard is the default post format in WordPress. It can be an article, a blog post, or anything the user want it to be. A standard post can also be any of the other post formats as well. For example, a standard post can have a gallery or a video. Gallery feature allows you to add multiple images in a WordPress post or page. You can add multiple galleries in a single post. Gallery is also one of the supported post formats so theme developers can add support for it and define the gallery presentation in their theme. 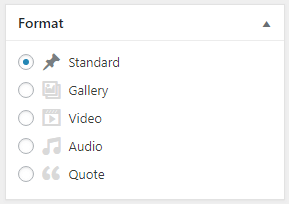 An image gallery in WordPress can be inserted using the Add Media button and then clicking on “Create Gallery” tab. Video is one of the post formats supported by WordPress post formats system. A post in video post format usually contains a video either embedded from a third party video hosting service like YouTube or uploaded and played directly from WordPress. Simply add your video link into the post editor. Audio is one of the supported post formats in WordPress post formats system. A post with the audio post type usually contains an audio file embeded from a third party hosting service or uploaded directly through WordPress media uploader. Simply add a SoundCloud link into your post editor and the theme will do the rest. Quote is one of the post formats supported by WordPress. It is used for quotations, specially when a user wants to just share a quote which is not within a standard post or article. The quote will be wrapped around a blockquote HTML tag.